This game is a blast and educational at the same time. Everyone gets a board with a very detailed drawing on it. Each board has a key letter at the top of it and the object is to find as many things in the drawing that start with that letter. Points are awarded for each successful find. The biggest pro in my opinion is that Scrutineyes is mentally challenging. It’s also easy to set up and easy to put away.As for the cons, there is only one that comes to mind. When the family would get together to play this, my dad never wanted to play because he says that the pictures are so detailed that they are hard to see. Editor’s note: the game is now out of print and there are some huge prices on Amazon. We recommend you buying it on eBay. 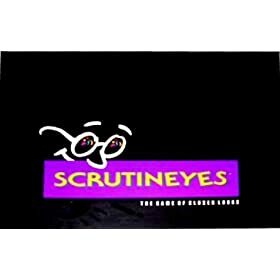 Scrutineyes is a great game for all ages and all types of people. It’s fun and challenging! This is my favorite game of all time! I searced for, Scrutineyes, for 10 years before I was able to re-purchase it online. One of the greatest games ever. It’s a shame they never followed up with it.